Objectives: The aim of this in vitro study was to compare the efficacy of two retreatment rotary systems in the removal of Gutta-percha (GP) and sealer from the root canal walls with or without solvent. Materials and Methods: Forty-eight extracted human mandibular first premolars were prepared and obturated with GP and AH Plus sealer. Samples were then randomly divided into four groups. Group I was retreated with MtwoR rotary system without solvent, Group II was retreated with MtwoR rotary system with Endosolv R as the solvent, Group III with D-RaCe rotary system without solvent, and Group IV with D-RaCe rotary system and Endosolv R solvent. The cleanliness of canal walls was determined by stereomicroscope (×20) and AutoCAD software. Kruskal–Wallis test and Mann–Whitney U-test were used to compare the data. Results: Results showed that none of the retreatment systems used in this study was able to completely remove the root canal filling material. D-RaCe with or without solvent showed significantly (P > 0.05) less filling material at all levels compared to MtwoR with/without solvent. Conclusion: Within the limitation of the current study, D-RaCe rotary retreatment system is more effective in removing filling material from root canal walls when compared to MtwoR rotary retreatment system. According to the Glossary of Endodontics, retreatment is a procedure to remove root canal filling material from the tooth, followed by cleaning, shaping, and obturation of the canals. After the root canal procedure, a tooth may require retreatment because of persistent infection or reinfection of the root canal. In addition, teeth with inadequate obturation, unfilled or untreated root canals, or under extended root fillings may require retreatment before coronal restoration as failure may occur in future. The main goal of nonsurgical root canal retreatment is to reestablish healthy periapical tissues. Only if the filling can be removed completely and the canal negotiated to the apical foramen, can the prerequisites for successful retreatment be fulfilled? The success rates of orthograde retreatment are reported to range from approximately 65% to more than 80%. Many materials are being used for the filling of root canals, of which Gutta-percha (GP) with a variety of sealers is the most common. Many techniques have been advocated for the removal of GP in root canal-treated teeth. Removal of GP using hand files with or without solvents is time consuming, especially when the fillings are well condensed. NiTi rotary retreatment system has been proposed because of their safety, efficiency, and speed in removing GP and the sealer. The objective of this in vitro study is to evaluate and compare the efficacy of two rotary retreatment systems - MtwoR and D-Race, on GP and sealer removal with or without solvent on extracted human teeth. Human single canal mandibular first premolars which were extracted for orthodontic purposes, having patent and almost straight canals without bi/trifurcation verified radiographically and using Schneider's method , were included. Forty-eight mandibular first premolars were decoronated at the cement-enamel junction by means of the diamond disk to leave a root 15–16 mm in length. A size 10 K file was introduced into the canal until it was visible at the apical foramen, and the working length was determined by reducing 1 mm from this length. Radiographs were taken. The specimens were randomly divided into four experimental groups with 12 roots each. The first 2–3 mm of GP was removed with Gates-Glidden bur #2 from the cervical part of the root. The retreatment files were carried into the canal using endo motor. Speed and torque were set according to the manufacturer's instructions. Mtwo R sizes 05/25 and 05/15 were used in a crown-down manner. Instrument size 05/15 was carried to the working length for the removal of filling material. Mtwo rotary files #35 and #40 file were utilized for the final cleaning process. The specimens in this group were retreated in the same manner as Group I except for receiving 2–3 drops of Endosolv R before insertion of each Mtwo R.
Root canal fillings were removed using the DR1 instrument in a crown down technique, followed by the use of DR2. Both #35 and #40 files with 4% flaring were utilized to complete the cleaning process. The specimens in this group were retreated in the same manner as Group III except for receiving 2–3 drops of Endosolv R before insertion of each D-RaCe. In all groups, canals were rinsed with 5 ml of 3% NaOCl between each instrument. All files were discarded after 4 uses. Retreatment was accomplished when GP is fully removed, and none was observed on the retreatment files. Radiographs were taken to ensure full debridement of the canal wall. The roots were split longitudinally using a diamond disk and chisel. The amount of remaining GP and sealer was evaluated in three segments: 1 mm above the apex (apical), 8 mm from the apex (middle), and 2 mm below the cementoenamel junction (coronal). Then, the specimens were examined using a stereomicroscope at ×20 magnification. After being photographed with a digital camera [Figure 2], the images were evaluated using AutoCAD software. The percentage of residual filling material in the root canal walls was calculated using the following equation. Removal was considered complete for all groups when no filling material was observed on instruments and no filling material could be detected inside the canal using stereomicroscope. Kruskal–Wallis test was utilized to compare the mean percentage of remaining GP and sealer in each group, and Mann–Whitney U-test was used for intragroup comparison [Table 1]. Results showed that none of the rotary retreatment systems used in this study was able to completely remove the root canal filling material (GP and sealer). 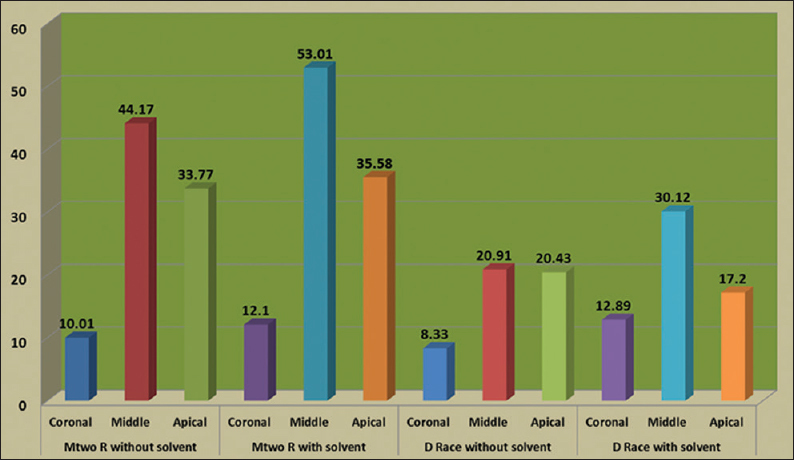 Root canals retreated with D-RaCe with or without the use of solvent showed significantly (P > 0.05) less filling material at all levels compared to Mtwo R with or without the solvent [Figure 1]. Group IV (D-RaCe with solvent) showed least remnants in coronal third and highest remnants in middle third. Apical third showed significantly lesser remnants when compared to middle third (P > 0.05). Removing all root filling materials is a prerequisite of nonsurgical retreatment as it allows subsequent cleaning and shaping and filling of the root canal system. Of various available rotary retreatment systems, only MtwoR and D-RaCe have two files each, making these systems simple and easy to use. D-RaCe rotary retreatment system consists of two files. DR1 (size 30, 0.10 taper, 1000 rpm) has a cutting tip to facilitate initial penetration of the filling material and is capable of coronal third cleaning. DR2 instrument (size 25, 0.04 taper, 600 rpm) has a noncutting tip and was used with light apical pressure until the working length was reached and is used for removing filling material from apical 2/3rd of the root canal. The space for dentine removal on the back of the blades is deep and provides sufficient space for the exit of dentinal debris, contributing to the superior removal of filling material. DR1 and DR2 were designed with alternating cutting edges as well as a triangular cross-section. The Mtwo rotary system also has two specifically designed files with cutting tips for retreatment. Mtwo R (15/0.05 and 25/0.05) files were operated in electric handpiece at constant speed 280 rpm and torque recommended by the manufacturer. The depth of the space designed for dentine removal is increased behind the blades, which provides the space for dentine removal and leads to efficient GP and sealer removal. Its capacity for good material removal is due to its structure. The Mtwo R instruments with positive rake angles act more like Hedström files and tend to remove bulks of filling material. In this study, the superior root canal cleanliness after retreatment with D-RaCe is in agreement with Rödig et al., who reported that D-RaCe rotary system is an efficient device for retreatment. In the present study, the better cleaning efficacy of D-RaCe rotary retreatment files could also be attributed to the higher rpm used when compared to the rpm used for Mtwo R rotary retreatment files. According to Ruddle, removing GP requires higher rpms than for cleaning and shaping procedures. The advantage of using higher rpm is that speed creates enough friction that mechanically softens and augurs GP from the root canals. The additional instruments are aimed to refine the root canal preparation, especially in the apical third, as the diameter of the apical retreatment instrument is normally in a clinical situation smaller than that of the file used for the instrumentation. The retreatment systems in the current study are similar to the previous study; however, the other parameters such as sealant and solvent are different. A minimum release of formaldehyde was observed for AH Plus when compared to AH26. AH Plus is considered as gold standard due to its low solubility, less expansion, and very good sealing ability. Solvents have been used to soften and dissolve GP in the root canal to facilitate its penetration and removal. Whether solvents are helpful during GP removal or not, is inconclusive. Chloroform is a Class 2B carcinogenic material and its use with these retreatment systems had a negative effect on the removal of filling material. Endosolv R is originally designed for softening hardened resorcinol-formaldehyde resin. The use of Endosolv R as a solvent in the present study led to GP and sealer residue on the canal walls. The reason for residual GP and sealer could be attributed to the solvents ability to soften GP and modify its structure to a viscous and highly adhesive material, which makes it more difficult to remove. The current results showed no greater efficiency of material removal when using this solvent. It could, therefore, be concluded that its use in retreatment with either Mtwo R or D-RaCe rotary systems might not be necessary. In the present study, both D-Race and Mwo R retreatment systems were more efficient in cleaning the coronal third of the root canals. This finding is likely due to the variable taper of the instruments; furthermore, Gates-Glidden size 2 which corresponds to size 70, was used to remove 2 mm of filling materials from the orifice. The use of Gates-Glidden drill is the most effective technique for removing root filling material from coronal and middle part of the root canal system. According to Fridman and Moshonov, an increase in canal size decreased the remaining material. In this study, complete removal of the filling material was not observed in all the groups. This is because of no chemical interaction between GP and AH Plus sealer, therefore, remaining sealer brushed on the canal wall might have increased the area of remaining material. This is in accordance with a study conducted by Schirrmeister et al. The present study shows the maximum amount of remaining filling material in the middle third of the root canals. The middle third has greater compaction of obturating material and sealer. Moreover, greater sealer penetration into dentinal tubules at the middle third could be the reason for greater amount of remaining debris in the middle third. Under the conditions of the present study, it was impossible to completely remove the root canal filling material regardless of the technique used. D-RaCe rotary retreatment instruments were significantly more effective in the removal of filling material from the root canals when compared to Mtwo R rotary retreatment system. The use of solvent in the present study did not improve on the removal of filling material from the root canals. No instrument fracture was observed in the study. The use of solvent, Endosolv R, had a negative impact on the removal of the filing material, even though statistically not significant. American Association of Endodontists, “Glossary of endodontic terms”, 2012, http://www.aae.org/glossary/. Bodrumlu E, Uzun O, Topuz O, Semiz M. Efficacy of 3 techniques in removing root canal filling material. J Can Dent Assoc 2008;74:721. Friedman S, Stabholz A. Endodontic retreatment – Case selection and technique. Part 1: Criteria for case selection. J Endod 1986;12:28-33. Somma F, Cammarota G, Plotino G, Grande NM, Pameijer CH. The effectiveness of manual and mechanical instrumentation for the retreatment of three different root canal filling materials. J Endod 2008;34:466-9.
de Mello JE Jr., Cunha RS, Bueno CE, Zuolo ML. Retreatment efficacy of gutta-percha removal using a clinical microscope and ultrasonic instruments: Part I – An ex vivo study. Oral Surg Oral Med Oral Pathol Oral Radiol Endod 2009;108:e59-62. Dadresanfar B, Mehrvarzfar P, Saghiri MA, Ghafari S, Khalilak Z, Vatanpour M. Efficacy of two rotary systems in removing gutta-percha and sealer from the root canal walls. Iran Endod J 2011;6:69-73. Azar MR, Safi L, Nikaein A. Comparison of the cleaning capacity of Mtwo and Pro Taper rotary systems and manual instruments in primary teeth. Dent Res J (Isfahan) 2012;9:146-51. Rödig T, Hausdörfer T, Konietschke F, Dullin C, Hahn W, Hülsmann M. Efficacy of D-RaCe and ProTaper universal retreatment NiTi instruments and hand files in removing gutta-percha from curved root canals – A micro-computed tomography study. Int Endod J 2012;45:580-9. Ruddle C. Removal of Obturation Materials. Advance Endodontics. Available from: http://www.endoruddle.com/FAQ?name=FAQRetxObtur. [Last accessed on 2016 Dec 08]. Marques da Silva B, Baratto-Filho F, Leonardi DP, Henrique Borges A, Volpato L, Branco Barletta F. Effectiveness of ProTaper, D-RaCe, and Mtwo retreatment files with and without supplementary instruments in the removal of root canal filling material. Int Endod J 2012;45:927-32. Garrido AD, Lia RC, França SC, da SilVA JF, Astolfi-Filho S, Sousa-Neto MD. Laboratory evaluation of the physicochemical properties of a new root canal sealer based on Copaifera multijuga oil-resin. Int Endod J 2010;43:283-91. Horvath SD, Altenburger MJ, Naumann M, Wolkewitz M, Schirrmeister JF. Cleanliness of dentinal tubules following gutta-percha removal with and without solvents: A scanning electron microscopic study. Int Endod J 2009;42:1032-8. Ramzi H, Shokouhinejad N, Saghiri MA, Samieefard A. Efficacy of three different methods in the retreatment of root canals filled with Resilon/Epiphany SE. Iran Endod J 2010;5:161-6.